Is it time to quit your puppy pads? All you ever had to do was put some of her poo and pee on the pad. Her own scent attracts her to the pad, and the blue color stands out easily in her limited field of vision. As long as there is a pad available, your dog won’t make a mess on the floor. But the puppy pads have got to go. When you use puppy pads, no matter how often you change them, no matter how often you disinfect your floor, they keep a distinct poopy-peepy smell inside your house. Worse, puppy pads get you accustomed to smelling doggy smells indoors, so you may not even notice the stink – but your guests do. They’re just too polite to say anything, and your dog is so cute, anyway. The cost can add up, but you can use cheap medical bed pads that you can buy in bulk. You can also use more absorbent puppy pads that last longer between changes. Some even have an attractant scent added to help your puppy find the right spot to go. Another problem with puppy pads: they do not require your dog to communicate their needs with you. This was a huge problem with Matilda when she was a pup. She used pads very easily. But, if we forget to leave her a pad, she would run to our room and poop on the floor, without warning us. It took a few weeks to transition from puppy pads to outside, but it was worth it. Our home smelled better, and she learned for the first time how to communicate with us – a foundation built in potty-training that lasts a lifetime. Begin by gradually cutting back on the number of puppy pads you use. 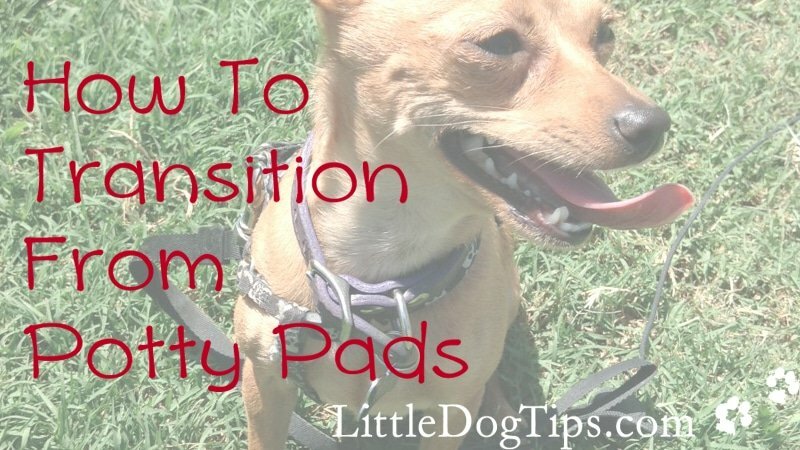 Eliminating the pads altogether can confuse your pup. It could cause her to have accidents, which will be a major setback in your training. It’s better if your puppy keeps using the pad between successful outdoor potties, than to have a bunch of indoor accidents. Do not praise your puppy for using the pad, but never scold her, either. Save the praise for those hard-earned outside pees and poops. You may want to leave a pad out when you go run errands, at night, and any time your dog is unsupervised. When you are home and available to supervise, you can use this time to go pad-free. The idea here is, if there is no pad on the floor, you need to watch your puppy. If you’ve run out of puppy pads, and have to eliminate them instead of gradually cutting back, you will need to watch your puppy as though they have never been trained at all. By now, you should be pretty familiar with your dog’s bathroom routine. You may notice them rushing towards the spot where the pad used to be. Upon noticing the pad is gone, she might start looking for another spot, sniffing and pacing about. This is where you will intervene so you can change your dog’s established bathroom routine. You need to teach your dog to communicate when you have to take her out. You can do this by training her ring a potty bell, having her spin, bark, whatever. Potty bells were a huge help in stopping Matilda’s accidents. When your dog is accustomed to using potty pads, they don’t develop that so-important skill of letting you know when they have to go. We really like Caldwell’s Potty Bells on Amazon, they’re long enough for even tiny dogs to reach! *In the spirit of full disclosure, this is an affiliate link, which means I will receive a commission if you choose to purchase from this company. By monetizing my blog, I can continue to provide free, useful information for dog owners. I only feature brands and products that I love and use with my own dogs. Dogs who are pad-trained are especially likely to take forever to do their business outside. By any and all means necessary, commit to getting that pee and poop outdoors. Even if you’re lucky enough to have a big, fenced-in backyard, you will need to wait with your dog until they do their pees and poops outside. Do not let your dog loose into your backyard to do their business while you are still potty-training them. Even if you watch from the window, you will not be able to praise them for their good work. The wait is the hardest part. Every dog owner hates the wait. She starts to do her poopy spin, but gets distracted by a bird – again. She starts to squat – but notices that the other tree is a much more suitable spot. Just keep waiting. It’s worth it. Running or walking can help speed up your dog’s digestive system, and jostle the pee or poop out of them. You can also leave a dirty pad outside to attract them to the spot with their own scent. Eventually, you won’t have to try so hard just to get your puppy to do her business outside. After a few weeks, it will become routine – she’ll almost automatically ask to go outside instead of looking for a pad. The hardest part is that battle of wills, in which your puppy is still magnetized to using a pad. Sometimes, you’ll find yourself waiting and waiting with no results. You might not be able to wait outside for hours and hours. Short breaks are better because your puppy will understand the point of the potty trip – rather than just happening to relieve herself outside during a long outside play session. After 20 minutes, if your dog shows no signs of doing their business, you could continue waiting, or you can take a break and try again in a few minutes. Some dogs pee and poop on the floor immediately upon getting back inside. It’s something about the warmth and comfort of being in the house again. Make sure this does not happen to you. Upon getting back inside after an unsuccessful potty trip, you’ve got to keep your eyes on your puppy at all times. If you can’t do that, put her in her crate until it’s time to go back out. In 15 minutes, get your dog outside and try again. Repeat until you get your first poo or pee. Just when you are about to give up and put down another pad, your dog is going to finally squeeze out a log in your backyard. And you are going to be SO. HAPPY. Let her know. Throw a potty party. Make it rain treats! Don’t go inside right away. Let her run around, play and sniff. Treats, playtime and praise are all part of the potty party. Show her that going outside is much, much more rewarding that using her pad. Though it might be cold out, relieving herself outside, rather than on a pad indoors, will become more rewarding. Even female dogs want to leave scent markings when they pee and poop. It takes a while to break the habit, but in the long run, transitioning from puppy pads to going outside is as rewarding for your puppy as it is for you. We have a 17 month old Toy Poodle. She was trained to use the pads and does a good job. She only uses the pads when we leave the house. For instance: on a Saturday when I’m at home, I will feed her in the am and she will not go potty until I leave the house for a few minutes, which may have been 5 to 6 hours after she has eaten. We do not see her use the pads. She is careful when shes goes. At night, after supper, she will not go again until after we go to bed. I take her out at times and say potty and have taken her poop out and take her near it and say potty but no luck. If I can’t know her schedule, which it is different, how can I potty train her to go outside? Please and thank you!! Good questions! She must be feeling shy about pottying in front of you, Matilda was like this too – what helped was using potty bells so she would have to consult us whenever she had to go. If she’s not going for you outside, I’d try taking her for a walk around the block to get her bowels moving and to encourage her to leave her scent – then praise her a LOT whenever she does go in front of you so she realizes it’s not a bad thing. Hello! We have been trying for days to get our 3-month old Mini Goldendoodle to potty outside, but he has been extremely hesitant. He was puppy-pad trained in no-time after we brought him home, but it’s time to wean him off them, as he is now caught-up on his shots. He is happy to go for frequent walks, but he will just refuse to “go” and will force himself to “hold it” for up to many hours at a time, and then he may have an accident in the house or rush away to a tough-to-reach spot and by the time we catch him, it’s too late. He’s very smart and has been quite receptive to reward-based training, but it has been extremely difficult to even reward him for going outside (even after spending HOURS walking and trying to get him to go), simply because he refuses to do it. We live in an urban neighborhood in a condo building, so we don’t have access to a go-to yard. We’re getting very discouraged and frustrated (and exhausted). We are trying all the techniques from multiple articles we have read, but to no avail. Any additional advice is tremendously appreciated! Your pup might be refusing to go because he’s not used to going outside, or he may even be afraid of doing his business in front of you, especially if he’s hiding to do it. If he’s afraid to go in front of you, you might need to backtrack and depend on the pads for a little longer. Keep taking him on walks, but keep him in a crate or near a pad when there’s a chance he’ll have an accident. Praise him even if he does his business on a pad, and avoid scolding him if he has an accident. When he does, just quietly take him outside, even if he’s already finished. He’ll eventually get the idea that he needs to go outside if he has the urge. How does your puppy communicate with you when he has to go, have you tried potty bells? Maybe a trip to the park can help, dogs seem to like relieving themselves in far-away places that smell like other dogs. Anything you have to do to get more “wins” – I’m sure you’ll see progress soon, especially if you stick with a schedule and technique. Good luck with your puppy! I have a 11 month pup she goes on the pad but will not outside. Before the 4th of July she was peeing outside until the fireworks she isn’t afraid of them otherwise. I take her out every hour with her brother she will sniff but nothing. She sees him go and I praise him. What am I doing wrong? She might still be in the “teen” stage, during which some dogs can be extra prone to developing fearful associations. I would try just spending lots of time outside with her, with lots of play, she’s bound to start going outside again soon. You can also try picking the pads up, only leaving them out when you’re sure you can’t watch her – she might just be very comfortable with them. Your article actually brought tears to my eyes. It’s like I told you the exact problems I’m having with my puppy and you knew just what to say. Out of all the articles I have read on this subject, yours was the most “real” – like I was reading an email from a friend who talks like a normal person and understands what it’s like to have a normal schedule and knows just how frustrating this can be. Thank you for that. Oh, wow. This is why I write! I’m so glad I could help, Patricia, feel free to contact me or leave a comment on your progress with your pup, or if you have any other questions. Thanks so much for your comment, it made my whole week!! Ditto for me. This is wonderful, helpful information. Thank you so much. At 7 months, he’s probably just starting to have enough control to start getting weaned off the pads. What happens if you run out or simply don’t put a pad down, will he have an accident? I find it helps to get rid of the pad and watch closely – when you see him looking for his pad, take him out. If he’s not going outside at all, you’ll need to really celebrate his first few potties outside to start getting him comfortable with it. my dog used to potty in the backyard but lately she doesn’t want to, she sits at the door and waits until we let her back in. What should I do?? Maybe the weather is getting cold where you are, or something in your backyard scared her. You may need to start back at a more kindergarten level of potty-training, watching her closely and taking her out often on leash to avoid her starting to have accidents again. I have a 3 yr old yorkie. She has always been trained to use the pee pad as I lived in a condo and didn’t have a yard. Now that I’m in a house I’d love to be able to start training her outdoors. Even when she plays outside she holds it until we get inside. How can I retrain her to go outside? Is Too late now to change where she goes potty? She might seem like she can hold it forever, but this period will pass – if you start to cut back on the pads and take her out a lot when she usually has to go, sooner or later she will go outside. Give her lots of praise and treats for going outside, and soon she’ll make it a habit. Feel free to post again if you’ve made any progress or have questions. Thanks for commenting! I have been putting paper down on the floor for 5 years nearly now, I am going to try to get her used to doing her business outside, but my dog used to have a real problem with being spiteful, we’ve stil got the crate, and we put her in it when we go out anywhere and put a lock on cage because she manages to open one of the doors in the cage, she would spitefully wee in her cage or on the floor and she gives you a threatening look before she does it. Oh my goodness! I’m not sure if dogs can be spiteful. What do you think she’s being spiteful about, not being happy about being in her crate? I’m inclined to believe that her expression may have actually been fearful. She might know that you would be angry at her for having an accident, and would be afraid of making you mad – it’s unusual for a dog to pee in her crate unless she really, really has to go. Do your best to stay positive. You might not be used to taking her on walks if you’ve been using paper, and that’s okay – it’s a good time to start taking her on lots of walks, play with her outside more, and when she does pee outside, make sure she knows it’s a good thing! Lots of treats and praise. She might also be so used to using paper, that she does not know how to communicate with you when she has to go. Potty bells helped us a lot when Matilda was transitioning. Under that spiteful little look is a dog who’s willing to learn, you guys can do it! Feel free to post back with updates. Thanks for commenting! I am so glad I found your site! I have an 11 month old male yorkie. He was given to me on January 1st (during a freezing illinois winter) and weighed only 1 pound. We used the puppy apartment idea – his little bed on one side and a potty pad on the other with a dividing wall. We transitioned his bed out of the crate, leaving the potty pad in there. Over the last couple months, I double downed to train him to only go outside. I have left that crate with the potty pad in it in place, to cut down on anxiety. I would like to move forward now and am not sure what the best way would be. I would like to use that same crate now for his den – put his bed in there and give him a safe place to retreat to. I don’t want to confuse him however – it is the same crate and would be in the same location. Do you have any recommendations? It sounds like your pup’s making great progress! I’d make sure the crate is completely rid of any potty smells with an enzyme cleaner and maybe move it a few feet away to help establish that it has a different use now. Then, gradually train him to use it as a den, keeping him in there for just ten minutes at a time when you’re home. You can also start feeding him in the crate or offering treats or chews there – dogs seldom poop where they eat. Awesome advice. I like the move it idea. I had a pen for when I was at work but now it is always open and only used to get to pee pad. And I did unintentionally rearrange the ‘nursery ‘ so the potty pad section is a couple feet from where it was when it was a whole kennel/pen. Thanks again. Lovin’ This blog! hi i have a 6 month old sheppard/lab mix and she wont go outside, i stand outside and sometimes play with her for an hour or two and the minute we come inside she gos. i dont know what to do but she wont go outside. i bring her to the same place every day and she wont go. is there anything else i could do?? Do you always have her on a leash? Some dogs are shy about doing their business close to their people, and a long line can help with this if you can’t let her run loose. She might also need a walk to get things moving, it sounds like you play with her a lot outside, though. Sometimes it helps to take her out on lots of short outings instead of 1-2 hour sessions. When it comes down to it, though, it takes time. Does she come inside and use a pad, or does she usually have an accident? We just rescued a 3 month old pup from the shelter. We have had him for a week now and he only uses the puppy pads while we are at work and at night while we are asleep. He is alone in the house on average 7 hours a day. He does very good using the pad while we are at work and after we get home he does very good going outside as long as we keep a close eye on him. My question is how do we get him to hold it during the day while we are at work and at night while we are asleep so we can get rid of the puppy pads all together. I’m afraid the house is going to start having an odor. He is contained in my laundry room during the day and when it is time for bed. And that is when he uses the pads. At three months old, it might be too much for your dog to hold it for 7+ hours at a time. Especially if you have a small breed dog. As for the odor, you might want to experiment with thicker pads that might keep the odor contained as much as possible. I think it’s better to stay on the pads a little longer if the alternative will be accidents. In the meantime, you can start getting your dog used to being in a crate for short periods of time, even just ten minutes. Then, when the dog is fully crate trained and can stay in there calmly for 7 hours, they’ll also be more mature and capable of holding it in. Also, if you’re taking out the pads when you’re at home to take him out, you’re on the right track. I have an 8 month old puppy with the same issue as above. He will ring the bell to go outside when we are home and awake, but we still put him in the kitchen use pads when we are away or asleep. What is the best way to ween him off the pads at night or away, when we can observe him? Lindsay, I’d love your advice. We adopted our female Jack Russell/chihuahua mixed pup as soon as she was weaned. On advice from friends, we used our old “Pack-N-Play” (children’s small play yard, with mesh sides) as her potty area, putting the puppy pads inside the Pack-N-Play. We would put her in there when she needed to go, and she had to stay in there until she had success, then we would take her out and give her a small treat. While that definitely made it easier to get her trained, as she learned to just stand in a certain place beside the Pack-N-Play when she needed to go potty, now she is 2 1/2 years old, and we’re a little tired of having this eyesore in our home. She is very much an indoor dog, as she is very small, and we don’t really mind using the puppy pads, but the Pack-N-Play has GOT to go. We have tried different things, as far as removing the Pack-N-Play and just putting down a pad, and have tried using the little pad trays that the puppy pads clip onto, but she is a creature of habit and won’t use the potty unless it is in the Pack-N-Play. On the rare occasions when we DO take her outside, she does go potty outside, but inside she is very picky. What would you suggest, as far as moving her “potty area” to a different location, as well as getting her used to just the pads as opposed to going potty in the Pack-N-Play? Thank you for your help! When you put down a pad without the Pack-N-Play, see if you can make sure it’s a little soiled, that way the scent of urine or feces will lead her to the new potty spot. What happens when you don’t have the Pack-N-Play available? Will she have an accident instead of using the available pad? I’d just get rid of it cold turkey, and within 2 weeks she’ll probably forget it existed. She might like the privacy of the “walls” – when Matilda still used pads, she always prefered to have it behind the couch. We have a 3 month husky/lab mixed, he is puppy pad trained and we are trying to get him to potty outside, we live in an apartment building so we don’t have a yard, and he is starting to make the house smell. We have a crate for him but he pee and poops inside it, we are out doing errands for about 2 hours a day. He has accidents frequently. We are trying to get him to shift from the pads to outside eversince he stained our floor. What do you suggest ? At three months, he might still have some trouble with control, but as a larger dog it might be easier for him to make progress. Make sure you never put the puppy pads inside the crate, you’ll need to crate train him all at the same time, especially if he also gets into other kinds of trouble, like chewing on things. To train him to stop having accidents in the crate, you may need to put him in there for just 10 minutes while yo’u’re at home, encourage him to eat and sleep there. While he’s relearning to not soil his crate, you might have to keep him on pads for a bit longer, at least until you’re able to get him more used to the idea of going outside. A pet gate can help if he has accidents around the house. The potty bells can be a game-changer for you guys too. I’ve tried a few times to put the potty pad outside, but it didn’t really help much, I just ended up with a dirty, soggy pad. What helped was taking Matilda for walks, dogs like to pee and poop in new places to leave their scent. Also, walking gets the bowels moving. Let me know if you guys are making progress, good luck! at the park, in the yard, etc. any tips would be so appreciated!!! When Matilda would spend time lolling about outside and not do her business, she had to go in the crate as soon as she got inside, or she’d do the same thing. Ten minutes in the crate, then outside again. At four months, it sounds like she’s getting there, it shouldn’t be much longer before she’s more reliable. I always do recommend the potty bells, that’s what really helped Matilda stop finding places to squat inside so she’d communicate with us instead. Some days, she’d ring the bell 8 times in a row, going in and out, but things got better by the time she was 1. Good luck! You guys can do this. Hi ! I’ve read some of your comments to other people but I wanted something a little bit more specific to me. My french bulldog is 14 months. He use to do really well on the wee wee pads but now he pees on the edge or near it instead of on it. He won’t pee or poop in front of me and when i do catch him i try and put him on the wee wee pad after. I would like to train him to potty outside but it is hard because of my schedule with work and school and because he won’t pee or poop in front of me… What steps should I take to get him to pee or poop on the wee wee pad even though he won’t do it in front of me? Should I wait until i have more time (summer ) to train him outside or should i start now? if so, what steps should i follow since my schedule will be inconsistent. Sorry to bombard you with questions! I had some of the same problems with Matilda, you may want to use two pads for now to give him more space to pee or poo. Matilda always misses the pad by a few inches when the lights are off! To help get him more confident about going in front of you, you may need to just not worry too much about him missing the pad, as he might hate it when you move him, even if you’re very gentle about it. The extra pad would hopefully help his aim. It’d be okay to take him for walks now whenever you have time, even if you’re still mostly depending on pads because of your schedule for now. It can help to get a longer leash, or tie a few leashes together so he can get further away from you – he might feel more comfortable about pooping and peeing that way. Then, you can reward him. I think I scared Matilda in the beginning by getting TOO happy when praising her for potties, which may have made her shy, too. A quiet “good doggy” and a treat or some cuddles or playtime would be a good reward. Dogs typically prefer to pee and poop outside to using a pad because they like to leave their scent in new places. He might like it if you take him to a park, or even just a new spot in your neighborhood. Running always jostled the poop out of Matilda, so that can help too. Hi! My husband and I recently got a now 3 month old male Maltese. We live in a condo building (3rd floor with out a yard), and since we got him about 3 weeks ago he’s used pee pads inside a playpen where he stays most of the day. I took him outside a couple times a week the 1-2 weeks but he thinks it’s for playtime and doesn’t want to go potty. This week, since he’s gotten another shot, I’ve taken him outside for 20 minute increments when i KNOW he will need to go potty (he won’t mess his crate, so I’m keeping him in there in between outside visits). He will sniff around and play, but he won’t go potty. I did it 5 times in a row today, outside 20-30 minutes, back inside in crate for 15, repeat and then I just gave up and let him out of the crate. Of course he goes pee immediately on his pee pad. How can we break this habit as quick as possible? How long does the transition typically take? Thanks!! So with a little Maltese, it can be tough – the transition can take any amount of time really. You’re on the right track, it does get frustrating when you spend all afternoon going outside, but you have to be just a tiny bit more stubborn than your pup. Having the pads down helped for me because whenever I saw Matilda rush over, I asked her to ring her bell or I took her straight outside, so I knew exactly when she had to go. But even then, it took a while. Some puppies do better when you make them stay in one spot, others potty faster if you take them for a walk around the block. Matilda would go on a patch of dry grass because of the texture. Hi I have a 9 week old Aussiedoodle, and he uses the pads most of the time, but will also have accidents throughout the house(he has full range). We have also been training him to go outside but its snowy/icy and he will only quickly pee at the back door and then want back inside. He has also been peeing very often say every 30min to an hour! Is that normal at this age? We do crate him at bedtime and when we leave the house and he does wonderful. Can you offer any advice on how to get his to only go outside and eliminate the pads and accidents? My husband would prefer us to not have a bell! Matilda peed constantly at that age, so I’d say that sounds normal. You’ll need to figure out why he’s having accidents – it sounds like he has too much unsupervised freedom in your home too soon. But the good news is you still have time to form good habits, and if you already want to stop using pads, you can get your puppy into the habit of going out soon – an Aussiedoodle isn’t a tiny dog, so he probably won’t take much longer to develop more bladder control. If you don’t want bells, you can train some other way to let you know when he wants out, maybe by nosing your hand. Best of luck! Hi, I adopted a jack Russell/rat terrier mix from the shelter. He is already 35 lbs and will be 5 months old next week. He took to the wee wee pads almost immediately and didn’t have too many accidents inside the house but I am having a hard time training him to use the potty outside. I live on the 14th floor of a coop so it takes us a few minutes to get downstairs. He will sniff everywhere and take his time but he just wont do his business outside. Do I remove the wee wee pads? Do I take them with me outside? I feel I have done more harm than good in training him to use the wee wee pads indoors. Any advice would be greatly appreciated. We’re crazy about fishing and you love dogs, how can we combine the two ? They will be your biggest fan, and they’ll be right there to congratulate you when you land a big one 😉 Great stuff! we have a maltipoo, 5 months old. he never really got the peed pad 100% and now we are taking him outside. we have the bells which he will ring if i say touch, and then i say we are going outside to go potty. we live in an apartment building and have to take an elevator down 7 floors before we get downstairs which fortunately i can carry him to the dog run. he will usually pee, sometimes he will poop, we walk around after and he might pee again before we go back inside. but he will still come back in and poop immediately or maybe even a little bit later on upon entering or go pee again shortly after we have returned. so in short, he is not holding it and he is not letting us know he needs to go out unless i see him going around in circles and sniffing the floor. we are taking him out after naps, after taking him out of the crate, or within 20 minutes of eating or drinking. help! I need to see a video of your girl trying to clean up her baby’s mess! Night peeing and pooping is possibly due to the fact that you’re not around to supervise. She poops outside during the day, right? What I’d recommend is crating your pup at night – or even having her in your bed, so she’s close to you, and you can wake up when she does and take her out when she needs a nighttime poop. Really, only supervision or crating will keep her from pooping inside at night. Also, you’re giving them dinner at 4PM, which is great because that should give your girl plenty of time to move her bowels before bed – but she isn’t. Maybe an after-dinner walk could help her get that night poop out before bedtime. We have 4.5 months old puppy. Unfortunately she was pad trained. She has no problems peeing outside and we always praise her when she does so. However she still pees inside the house and she never makes any sign when she has to pee. I have to constantly watch her and run out with her when she wakes up and on occasions I let my guard down she just pees anywhere (mainly on the pad but sometimes just random places). We have two pads left for her, one next to her bed for the night and one in the living room. Please help because it feels like she will never learn to communicate her needs. When Matilda was about that age, I had the same problems, but especially with #2. Have you provided a way for her to communicate, like a potty bell? That helped majorly with Matilda and nearly eliminated her accidents. I did buy her one and tried training her on it but she just doesn’t seem to get what it’s for. She’s not a very bright dog to be honest, other than sitting I can’t teach her anything because she is too excited to pay attention to me. At her age that’s not really unusual, really short, simple training sessions with plenty of treats, or even using her food as rewards, she’ll get the idea in time and she’ll soon be excited when she knows it’s time to train. Also, you’ll want to train her indoors, with few distractions. I guess it depends on what you mean by too excited, is she just going crazy over the food, or is she distracted? Hi, we have a lovely 14 week old Cavapoochon. Molly was pad trained but has now had her injections and can now go out so we have been trying to get her to toilet outside. We have had a few successful poos and wees outside but only after spending hours and hours going in and outside. Molly will literally hold till she gets back in and wee immediately with no sign. She doesn’t even do it on the puppy pad as she seems so desperate to go. We have a schedule but she seems so stubborn! I just got a five month old chihuahua almost 3 weeks ago. She had never been outside, I was told she was doing good using puppy pads, and would go where the puppy pads were supposed to be if they weren’t there. I have three other dogs and always take them outside. She started using the bathroom outside as soon as I got her home, because the other dogs were. She will pee as soon as i take her out, and pee again, or try to a few time within a few minutes. I watch her when she is inside, unless she is in the chair with me or playing with my chaweenie on the couch. She will pee within a short time after I bring her in without warning at different places. I have caught her before, and during more than a few times, and scolded her, and took her outside. I took her on a day trip for 15 hours, and couldn’t get her to pee a single time, and she only pooped once, so I know she dosent really need to go that often. And just now she peed on my couch which she had never done, so if anything its getting worse. What can I do? After that long trip, especially if your puppy wasn’t drinking much water that day, I’d want to have her checked by your vet for a UTI. Especially after she randomly peed on the couch, in such an unusual spot, that could be a sign that she has an infection. I’d rule that out first. For your first 3 weeks with a 5 month old chihuahua (they really do pee a lot at this age) – it’ll take a bit longer for her to “get it” if she ends up not having an infection. I have a 4 month old puppy. Got her ar 7 weeks. I use puppy pads behind a gate where her food and water is she do very well back there when I’m not watching. I’ve taken her outside and she will use the bathroom outside too. But she still pee and boo boo in the house as well. Bella is not showing any signs when she needs to go. What should I do? we have a 5½ month old cavapoo he is fantastic with going outside but we are at work from 9.00am until 2.30 pm and we have to put a puppy pad down for him. How do we remove the pad and know that he can hold it without being in his crate during the day? 5.5 hours isn’t very long for an adult dog, but at 5 months, I’d keep the pad a bit longer. I would try leaving without the pad for, say, an hour while you go to the grocery store, 2 hours while you go shopping, just make short trips and see how he does. If you’re coming home from work to a dirty pad, that’s a sign that he still needs it, but if it’s often dry, you can try going without. I’d personally rather clean up ad dirty pad than move too quickly and have accidents. I love this helpful page! I could really use some advice. I have an 11-week old mini schnauzer who learned to go on pads. He does a great job of going faithfully on the pads. I find it very convenient because I can sleep through the night without having to get up and let him out. However, I want him to learn to go outside, but what I’ve read is that puppies his age usually can’t hold it through the night. During daytime I have put pads outside and have gotten him to go on them, but not consistently. Sometimes he waits until he gets back to the inside pads. I’m wondering if I’m making it too confusing having them inside and out. I’m also wondering what age he might be able to go outside 100% of the time. Not sure what’s the right way to go. I need help on getting my 6 month old Chorkie to transition from her pads to outside. Her pads are outside on my apartment patio so she knows to go to the door when she has to go but I want to start training her to go to the front door to actually be taken out on a leash to go to the bathroom. Matilda was exactly like that when she was a puppy! It sounds like you’re doing everything right. There’s a reason for you pup’s dependence on pads – they might be too available, and it could help to try taking them away for a few hours at a time. What do you do when you take the puppy out – do you go on walks, or do you let them loose in the yard? Sometimes it can help to go to the park so your pup will smell other dogs’ wastes, sometimes it helps if you walk to get things moving, and some puppies do better when they’re loose in the yard rather than on a leash. Thank you so much for this article! I have a question, though. I’ve been doing all this, and my puppy is more than comfortable going outside, but she also keeps going inside. Sometimes when I’m replacing a pad or try to take it away, she still goes on the floor in the same spot 🙁 any tips on encouraging her to tell me when she needs to? I feel like I take her out a lot when I’m not home. Maybe using them during the day confuses her. Hi Abbey! Does she have a way of telling you when she needs to go out? I really like potty bells for this, when you catch her running to her “potty spot” you can tell her to ring her bell instead, so she’ll know that no pad=tell mom to go outside. Hi Lindsay, I’m so glad to have found your website after having looked at many others. My husband and I adopted our female Maltese puppy just days before I had a heart attack. Since then we have been struggling to do what is right for our little girl as far as trying to wean her off pee pads. Chloe is now almost 4 months old. When we do not have her with us, ( for playing and holding), or running around the kitchen supervised, she is in her dog fence near us in the house which has the floor lined with pee pads… she has her crate and toys inside the fence too. After meals and play time and quite often in between, we show her the way out the back door to the dog run where we have one of her pee pads on the ground. We wait for her to hopefully pee on it and then immediately reward her with a yummy treat and praise. Sometimes she does,and sometimes she doesn’t. She is still going inside her fenced area. I’m wondering what we may be doing wrong or what else we can do to help her more. Should we take all but one of the pee pads out of her fence area? Any other advice you can give us will be greatly appreciated! Thank you! My puppy is 7 months old. I use the pee pads as well as take him outside. I take him out in the morning and when I get home from work. He does a great job going outside and we have a huge potty party, but he still has accidents in the house. He tends to go next to his pee pad rather than on it, or will be halfway on the pee pad but miss the pad and go on the floor. Should I be more focused on training him to use the pee pad without accidents before transitioning him to going outside? If so, how can I train him to use the pee pads without so many accidents? (I keep his scent on the pads and leave them out in the same spot). I was reading other people’s questions and your answers. Thanks for writing this!!! So if Matilda would ring the bell 8 times a day, you still take her out 8 times a day? And praise her and give her treats every time? My Maltese is so smart, I feel like she would just do this to me just to get the treats. She’s almost a year old now. We got her in the middle of winter in the east coast last year. She got trained on pads and caught on immediately (like I said, she’s extremely smart). She does prefer to go outside when I take her, but even though I try to take her out every 2-3 hours sometimes she’ll just go on the pad after like an hour or so (and comes looking for treats) Sometimes she’ll hold it for 4 hours with no problem. Just random. We asked some relatives to watch her for a weekend. When I brought her there, I brought the pad and set it down in one spot and said “pee pee, it’s for pee pee” which she knows the command to pee. I asked my relatives to take her out every few hours which they did. But she still had accidents inside the house (NOT on the pad) which was so bizarre to me since she hasn’t had one in almost a year. I’m trying the bell thing and she kind of gets it but is still using the pad. I guess my question is, if I keep praising her and giving her the best treats she loves when she goes outside, and ignore if she uses the pad inside, will she eventually get it? Or do I have to keep running out every time she uses the pad? I live in a condo on the second floor and going in and out 8-15 times a day it’s just not possible for me. Sometimes I don’t open the door when my dogs are ringing, especially if they’re barking, or if I just suspect they want to go out and bark. Once they learn that ring door = go out, you don’t have to give treats anymore. I’ve always had trouble with dogs having accidents in other people’s houses, the smells are new, and they may even want to pee everywhere to surround themselves with their own scent. About getting her to stop using the pad – well, living in a condo, do you want her to go outside 100%, or would you like her to ring the bell when there’s no pad, but maybe you’ll put a pad down only sometimes, like when it’s really cold out, or when you’re not home? What really helped with Matilda was just taking the pads away when I was home watching her, and when she would run to where her pad would normally be, I’d take her out. Now, I only put down pads a few days per year, during blizzards and big rainstorms, and even then she usually holds it. I have a 4 month old male Shih-tzu who was 10 weeks old when we got him. The woman I got him from is handicapped, living in a upstairs apartment. Needless to say Laddie was pee pad trained and in fact I believe he had never gone outside except to go to the vet for his shots once before I got him. He is very well trained with the pad, never an accident as long as there is a pad down. I also have a 4 year old male Shih-tzu at home who is only outside trained. I have been trying to transition Laddie to outside with varying degrees of success. I have moved his pad to the kitchen where it it is within sight. When I see him go to the pad I stop him and take him outside (he also goes out every time my other dog goes outside)He will pee outside after a bit most of the time at which time he gets a treat. When he does not go pee he does not get a treat but he thinks he gets one for just going out the door. To this point he will walk to the pad and stare at me, I let him out, wait for 30 minutes and let him in after he has done nothing, he wants a treat. He will also just walk to the pad and go with no warning a lot of the time. Pooping outside is more difficult, the only way I can get him to poop outside is to catch him going into a squat and bring him out before he goes. If I take him out before he squats he just holds it for however long and then goes inside. I am really getting frustrated since it has been almost 2 months and he is not even close to being outside trained with any regularity. I try to watch him like a hawk but he still manages to get to the pad. Due to the layout of my house it is not feasible to move the pad nearer to the backdoor and still be able to keep an eye on him. He knows he can go outside but also thinks he can go inside as well. If I pick up the pad he goes anywhere he can inside. At night he sleeps with me and is unable to jump out of bed on his own so no accidents.He also is crated if I am gone and no accidents there either. I’m about at the end of my rope..
Four months old is still young, especially with a small dog – it sounds like you’re doing everything right, it’s just a matter of time and consistency. Since he’s pretty good at using the pad, he does have some control over his functions and will make progress soon, hang in there! Have you tried potty bells, or any other way of having your little one let you know when he has to go out? I have not tried a bell, I have never had a dog that didn’t bark or growl…something to let me know they needed out. I am unsure how to bell train as he does not go near the door when he has to go..If he just goes as soon as he feels like it, how can he learn to ring a bell to tell me? Since I first wrote he has regressed a little, where he will now have accidents in another room of the house at least once a day. Always poop, never pee. I believe he thinks because I stop him when he goes to the pad, he thinks he is not always supposed to go there, at least to poop. But instead of his puppy brain saying “Ok I am not supposed to go here on the pad, maybe I should go outside where I get treats” he is saying “If I can’t go on the pad, I’ll just pick a new place” So I have to be very careful with the way I act when he goes on the pad or he starts breaking all his training..He can be playing and within 5 seconds be on the pad..no warning and no chance to stop him. I have a 3 month old mini labradoodle (10.6 lbs). She has always slept through the night and never had an accident in the create. I have her on the wee wee pads since I live in NYC and she was too small and didn’t get all shots. Now I need to transition to outside. The bell I would do later since she doesn’t even know how to go outside yet, so, it seems as though she needs to understand how to go to the bathroom outside before incorporating a bell. Should I leave one paper in the house and just take her out every hour that she is out of the crate? I am unsure how to begin the training process to make her only go to the bathroom outside. Should I take the paper away when she is out of the crate? Sometimes she will pee outside, then come right back in and pee a little more on the paper. Or, even when going on the paper she will pee a lot, then a few minutes later pee a little extra on the paper. She is going a lot, but I was giving her treats when she went on the paper which I have stopped doing. Just not sure how long she can realistically hold it while out of the crate. Hi Alex! Congrats on your new puppy. Three months is still really young, though she’s not a tiny dog, it sounds like she will still need to learn to recognize the feeling of having to go. So, I wouldn’t rush to get off the pads just yet, at least not until her potty schedule is more predictable. Matilda would do that too – pee a bit, then pee again less than an hour later. I don’t think it’s too soon to start with the bells, I started really early with them. When Matilda was really little, I left the pad down all of the time, but if I caught her running to it, I would encourage her to ring her bells and go outside instead. Then as she got a little older, I would go an hour without pads, heavily supervised/out of crate, watch for signs that she had the urge, and so on. My boyfriend and I recently adopted a 6 month old Pomeranian/Sheltie mix. He is extremely smart and food motivated and typically a good listener, but we are still struggling to perfect his potty routine. He was already puppy pad trained when we got him 2 1/2 weeks ago and did very well the first week with only 2 or 3 accidents, but has gotten worse and worse in the past week with peeing on the floor and carpet. Now it’s about 50/50 if he goes inside. Originally, he was so afraid of the outdoors, he would always hold it until we got inside. Now, he is slowly getting more comfortable with being outside, and we have finally gotten him to relieve himself outdoors, but it is not 100% of the time (and this has happened only in the last 2 days). Still, he is peeing in places he shouldn’t in our living room (sometimes near and sometimes away from the puppy pads). We are getting bells to hopefully improve communication with him, but I’m wondering if he’s peeing in these areas to mark territory or to get attention. Sometimes it is the same spot on the carpet, but sometimes it’s a new area on the floor. He was using the pee pads perfectly, so I don’t understand why suddenly that has changed. Should we take up the puppy pads all together at this point? I’m afraid to worsen his accidents. How do we handle an accident inside vs a puppy pad pee indoors vs an outdoor pee? What is the best way to proceed in getting him to go outside 100% of the time and eliminate these accidents all together? Congratulations on your new puppy! My thoughts are that since it’s only been about two weeks, he’s still experiencing an adjustment period. He may just need to be confined more, maybe to a kitchen or playpen with a few pads inside, or crating when you can’t supervise him. I’m thinking it’s stress, confusion with the new scents he’s still discovering in your home. I wouldn’t stop using the pads at this point. Is he lifting his leg on things, or just squatting and having full accidents? If he’s just lifting his legs and leaving dribbles, it’s marking. As for handling accidents, it’s best to prevent them, and if you catch him in the act, you can distract and redirect him. How’s he doing with #2s? I’m not sure if I answered all of your questions, and of course it’s hard to really understand the situation without being there, but feel free to let me know if you think of anything else! Hi, I’m so happy I found this article! I have a male yorkiepoo who will be 2 in July. We were living in the city and had been using pads to make life “easier” plus he was originally afraid to be outside. Although I would say he is pad trained, he often goes on the corner of it or right beside it leaving a mess for me on the floor. I feel like he thinks if he as at least one paw on the pad that he’s doing it right lol. Anyways! We have moved and have plenty of outdoor space now and I have been trying to transition him to go outdoors as I’m so so sick of the pads! I know he can hold it just fine because he never uses the bathroom when we are gone, even the pad. I read that you recommend not eliminating them right away, but I’m conflicted because when he knows the pad is down he doesn’t try to hold it much at all and will go do little spritzers often. We found he did that to try and get more treats and we have stopped giving him treats for pad use. I have yet to put a pad down since our move and he seems to understand when I take him out to potty, he often does his business pretty easily and I throw him a party. However, I’m still finding that if my timing isn’t just right he will poop or sometimes pee inside without warning. I’ve ordered the bell from amazon last night and am hopeful that will help. I’m just feeling overwhelmed and discouraged at this point because I’m trying so hard and feel like I’m not sure I’m progressing, as the communication isn’t there. Do I put the pad back out as I continue to take him outside? Or is that a step backwards since he will just use it whenever in hopes of a treat. Help!